Originally founded in 2003, Stars Viper Cheer and Tumbling is recognized nationally as a leader in developing high level athletes, both in all-star and school competitive cheer. The ownership and coaching staff prides itself in maintaining a family environment and holding to high quality standards. Danny and Rebecca Rios are proud owners of Stars Viper Cheer and Tumbling. Rebecca brings many years of leadership and school cheer experience due to her prior service in the Schertz-Cibolo-Universal City ISD. Danny proudly serves as a leader with USAA financial service company. Together Rebecca and Danny are committed to creating a business and environment that their staff, athletes, parents and community can be proud to call family. The Rios Family is committed to creating a culture of respect and tradition of success. 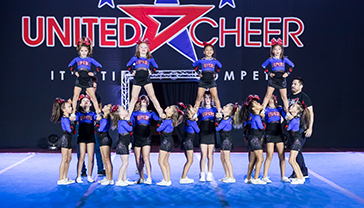 The Mission of Stars Viper Cheer and Tumbling is to provide safe, quality services focused on teaching young athletes solid fundamentals in tumbling, school cheer, and all-star cheer for school-aged children in Central Texas. Our coaching philosophy is designed to help athletes self-discover their own ability through high-quality instruction in a fun, disciplined environment. The goal is to create strong independent leaders who apply their learning and work ethic to experiences throughout their life and future leadership roles. Visit San Antonio’s Best Cheer Gym Today! Our coaching philosophy is designed to help athletes take ownership their own development using a proven process of instruction in a fun, disciplined environment. Call us today at (210) 566-3200 or via email.